Unusual boxwood carving of a bearded man. 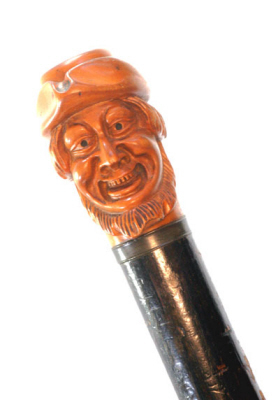 One side of the cane is the carved face of anger the opposing side the study of happiness. The figural study mounted on a stained briar shaft with original base metal ferrule. The carving is beautiful and very tactile.The cane shaft straight and free from breaks or cracks. Areas of the stain worn revealing the under wood.